Based in Cleveleys in Lancashire, EasierThan Business Software are a small business software development and support company serving Blackpool, Preston, Lancaster and surrounding areas. We have experience in dealing with everything from a simple spreadsheet merging routine containing a dozen records to systems involving hundreds of thousands of records, in some cases dating back to the dawn of computers. With EasierThan Business Software you're in experienced hands. Its founder, David Barton, has been programming computers since 1987 and has been designing and implementing business database systems since 1991. 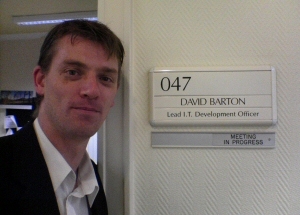 David's most recent employment was as an IT Development Manager at Wyre Borough Council. Amongst other things he was responsible for a team that developed and / or supported most of the Council's database systems. These included the development of systems related to all manner of Council functions including Taxi Licensing, Food Safety, Dog Wardens, Parking, Local Plans, Bulk Bins and more, along with responsibility for key systems such as Council Tax and Planning. To get a flavour of what we're capable of, take a look at some of the case studies listed on the various pages of this website. Testimonials from a number of clients are also available.